Select JavaEE perspective. 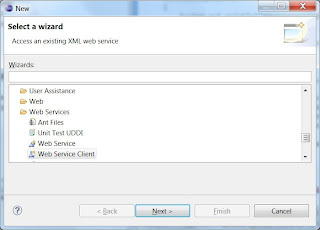 Create a new Web Service Client project: File->Other->Web Service Client. On the next screen, enter your WSDL URL, then move the slide on the left side all the way up. Then just click finish and let Eclipse does its magic. 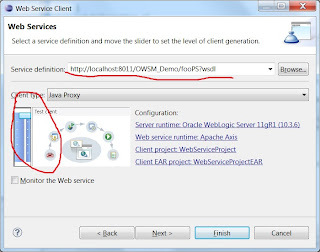 I added a server in Eclipse to point to my local Weblogic. To deploy the new project to the server (I suppose there are better ways to do it): Select Run, Run As, Run on Server, then select the ear to deploy. I only do this once. If I make changes later, i just right click on the server (Tab on the bottom), then select "Publish". 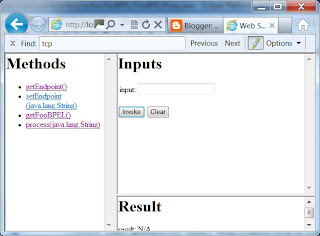 When the deployment is finished, you will get a link http://localhost:7001/WebServiceProject/sampleFooBPELProxy/TestClient.jsp (again, all of these are auto generated, i haven't done a thing yet). As you can see there is one "process()" method. Try invoke it, it would fail, because there is no security header. For sanity check, you can go to OSB fooPS, remove the WSS security policy, then try to invoke "process()" from the test page again, it should work correctly. Otherwise, you got other problems you need to sort out first before worrying about the security. 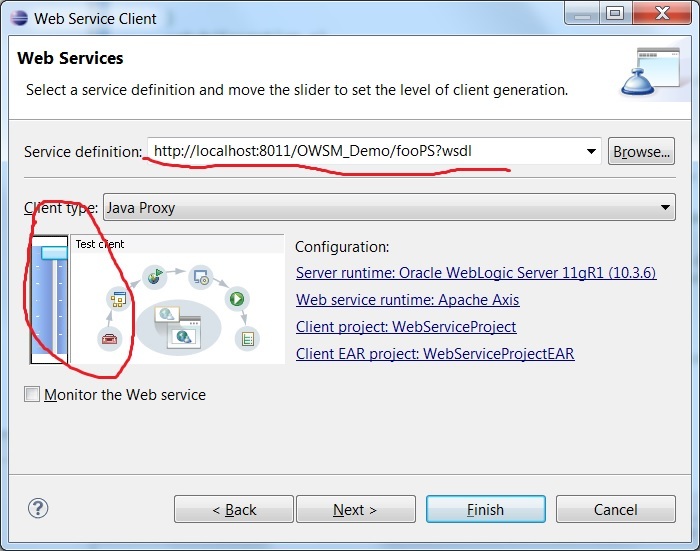 If it works, then you just succesfully created a Web service client with Eclipse. Next, I'll show you how I managed to add the security header to the client. In fact, the change is very mimium, but it took me a while to figure it out. Firstly, i went down a path that did not work out. In the previous post (command line java web service client), the client program relies on casting the "port" into "BindingProvider", then set the security header that way. I just couldn't make it work with the Eclipse generated classes. I couldn't find the equivalent of the "Port" class in this case. Although there is getPort() method in "Foobpel_client_epLocator" class, but I have no way to cast it into the BindingProvider. That's my hack to make it work. This may not be the way you code for production, it's just a proof of concept. Miracle post.. thanks for sharing.. Life saver..